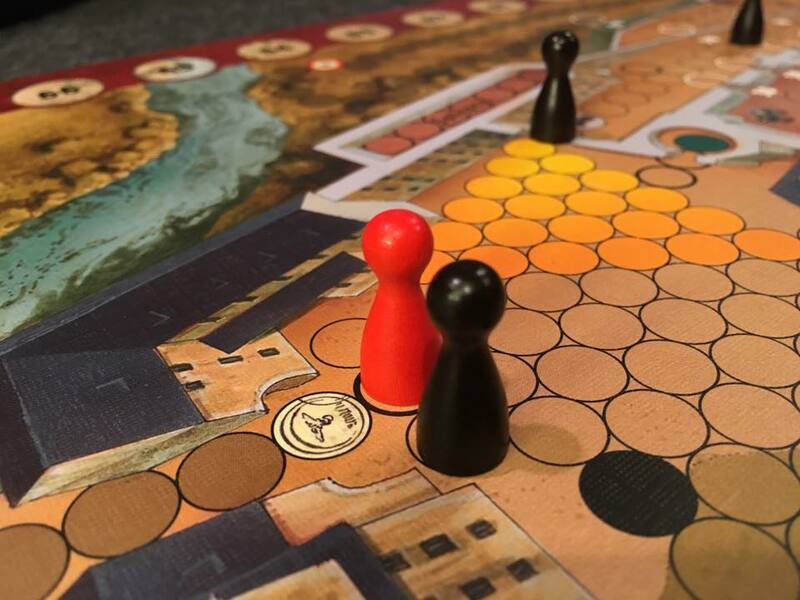 Escape from Colditz allows players to immerse themselves in the historic escape attempts by the multi-national groups of POW’s secured inside the walls of Colditz Castle during WWII. 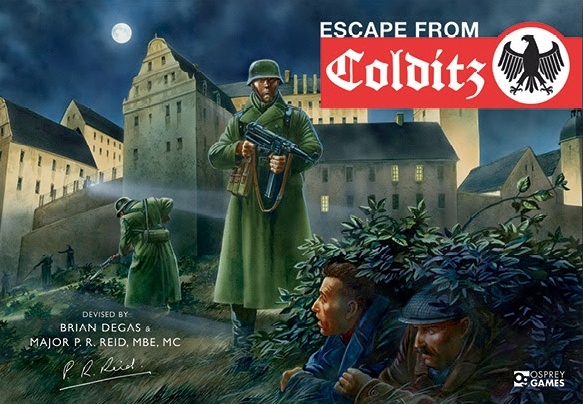 Escape from Colditz delivers an aesthetic high the moment you see the box cover, but just wait until you get inside. The large mounted map board with muted colors and detailed imagery of the castle grounds immediately evokes the solemnity of prison life. A small box of components is disguised as a WWII era parcel from the Red Cross. Pop it open and you’ll find historic documents folded inside (along with the wooden playing pieces), just for fun. The card decks are wrapped in heavy cardboard sleeves and tucked into recessed storage areas to keep the surface flat for the storage of your game board. You’ll find a facsimile of an historic relic folded inside one of these, too. 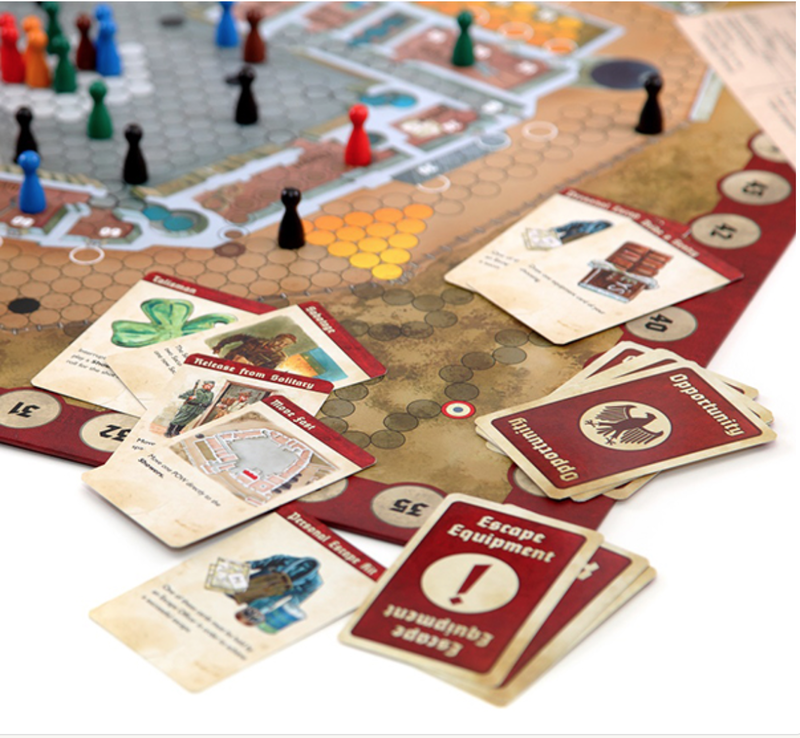 The rules are accompanied by a 30-page booklet of history that covers the events about to unfold on your table. And underneath the storage tray there is another hidden surprise, but I’ll leave that one a secret. Everything in this beautiful game instantly establishes a feeling that you’re about to step back in time, and the elements of secrecy and discovery are as much a part of the packaging as the game itself. 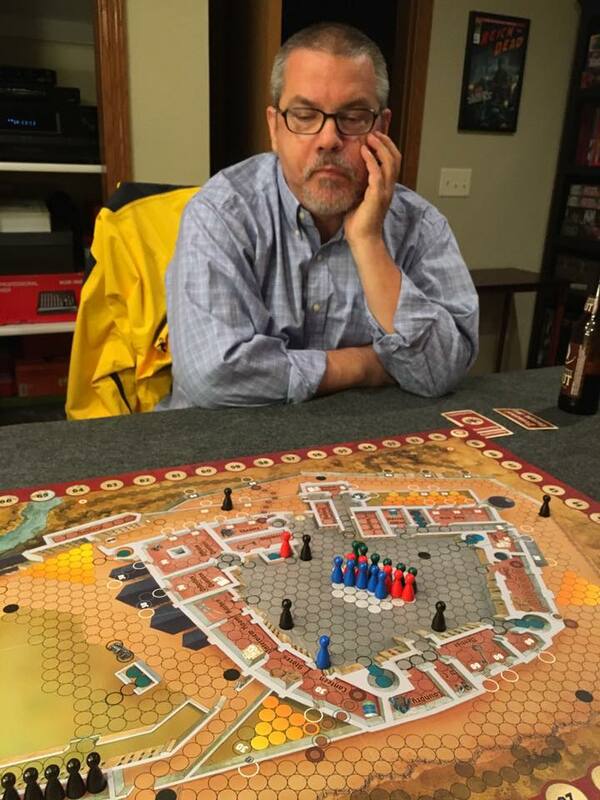 In Escape from Colditz, playing the role of adversary is the German Security Officer who will spend turns maneuvering prison guards into positions that are a detriment to the conniving Escape Officers. At the same time, as many as five Escape Officers each control a team of POW’s based on the number of players in the game. 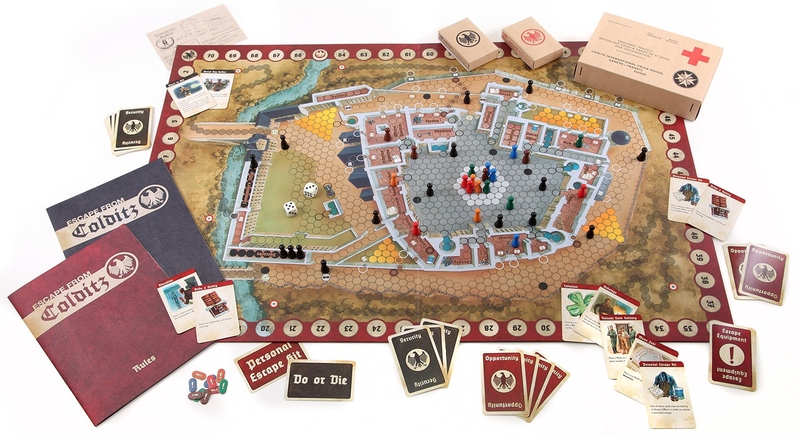 In a four player game, for instance, the German Security Officer will have 14 guards to thwart the relentless plans of 18 POW’s (six per Escape Officer). Historically, the prisoners of Colditz assigned escape officers to each group of prisoners based on nationality so as to not interfere with the escape plans of the other groups. Yes, making escape plans at Colditz was really that pervasive! The ultimate goal of the game is for any one player to run two POW’s to freedom. As a group, you can also decide on an arbitrary number of escapes spread among the group in order to increase or decrease the difficulty. Escaping is no easy task. The board is a honeycomb of circles, which are the spaces on which the guards and POW’s move. I can’t overstate the enjoyment of scanning the prison grounds for potential escape routes. It really puts you inside the game as you not only plot your path, but watch the guards and their movements closely, searching for holes and opportunities. Once players have settled on a few ideas to outwit the German Security Officer, they begin collecting Escape Equipment by visiting various rooms inside the prison. Rope, wire cutters, keys and passes are all the tools of the trade, but planning an escape comes with a price. Players in possession of these tools can now be arrested and sent to solitary confinement, and if a POW is caught outside the inner courtyard, the Security Officer will lose a piece of equipment! Teams of prisoners make their way around the inner courtyard’s rooms to collect all manner of escape equipment. Meanwhile, the guards position themselves in places that may facilitate future arrests. Rolling five or less allows an Escape Officer to draw an Opportunity card (the German Security Officer draws from a deck of Security Cards). 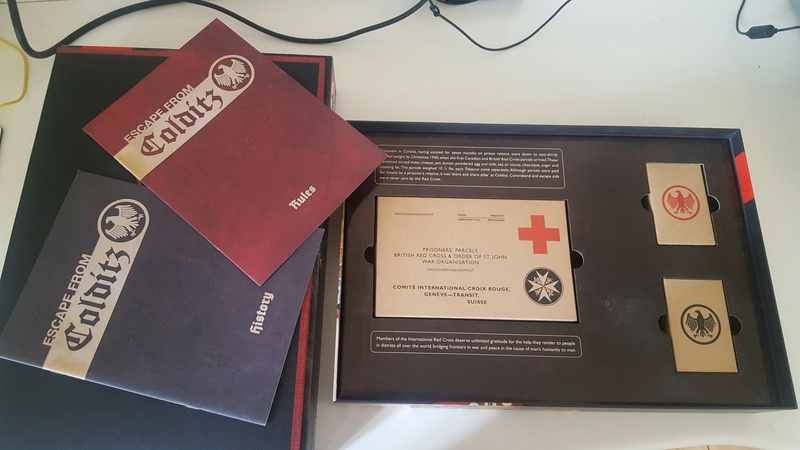 For the POW’s, these cards contain all sorts of interesting strategies to foil the Nazis. 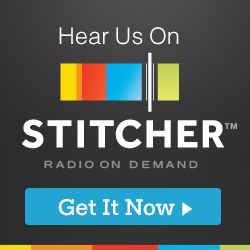 Everything from opening tunnels, to avoiding equipment loss when being arrested, to bribing a guard for a piece of Escape Equipment are included, plus a whole lot more. These hidden tools can be an integral part of any well-hatched escape plan. 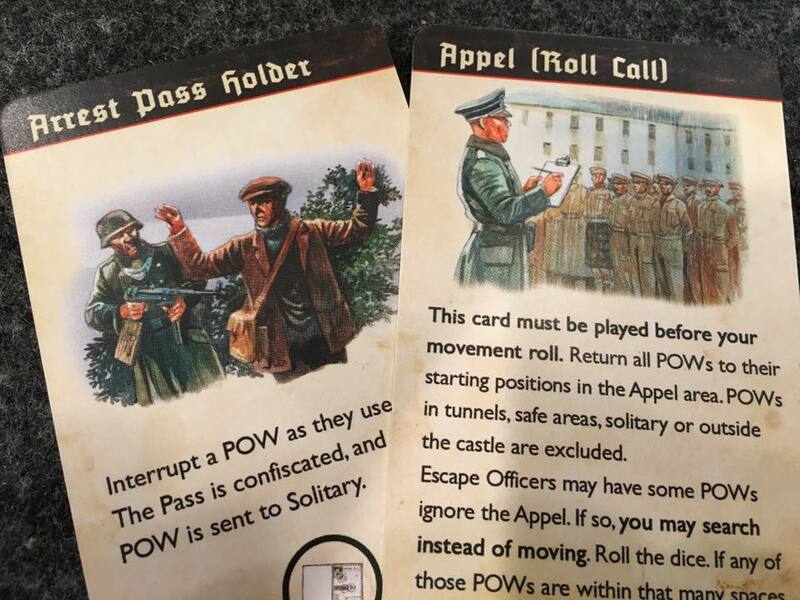 Of course, the German player also has his own share of toys to mess with the players, such as the enjoyable “Take the Shot” card that gives you a chance to kill an escaping prisoner, or the Appel (Roll Call) card that gathers all the prisoners into the inner courtyard, unless some prisoners wish to defy orders and take their chances. But nothing beats rolling doubles if you’re jonesing for freedom. Not only does rolling doubles release a prisoner from solitary, it grants the player another 2d6 roll to add to the previous one, plus another roll if the player is lucky enough to roll doubles twice in a row. That usually means major movement points, and if you’re playing the POW’s, that often means it’s time to run like hell toward freedom! There’s no better foil to a prisoner’s tunnel escape plan than playing the “Tunnel Detected”card! A friend made it over the prison wall with a rope, cut the wire fence and began a sprint toward freedom. Standing at the fence, one of the guards fired his rifle at close range and missed. The POW made it out safely, despite the terrible odds stacked against him. Another friend waited for several turns at the front gate of the prison next to a guard (there are “safe” places where players are safe from arrest). We imagined that the prisoner was in disguise and having a long discussion with a naive guard. “So, when does your shift end? That Hitler is insane, am I right?” Waiting for the proper moment, my friend rolled a 21, but instead of a sprint to the outside world, I played a card to confiscate his “pass” and sent him to solitary. So much for looking all casual. My wife and her POW’s, having just been called to the inner courtyard by the guards, played an “Advance Warning” opportunity card to ignore it, moving a team of prisoners into a secret tunnel. In just a few turns, one of those prisoners intentionally ran into a prison guard (which is a way to temporarily remove a guard from the board at the expense of sending a prisoner to solitary), while another prisoner from the tunnel escaped through the fence. In another bold escape, a friend’s POW scaled the walls using 90 feet of rope (that’s three rope cards), bolted to the staff car in the courtyard, and drove to freedom, ignoring everything in his path. It’s stories like these that seem to be plucked straight from Hollywood movies that make Escape from Colditz an exceedingly enjoyable and often cinematic experience. The red player’s POW makes a made dash toward freedom. The red tokens represent the ropes she used to scale the walls. The black guard pawn stand absentmindedly near the orange player’s POW that is stuck in solitary confinement. 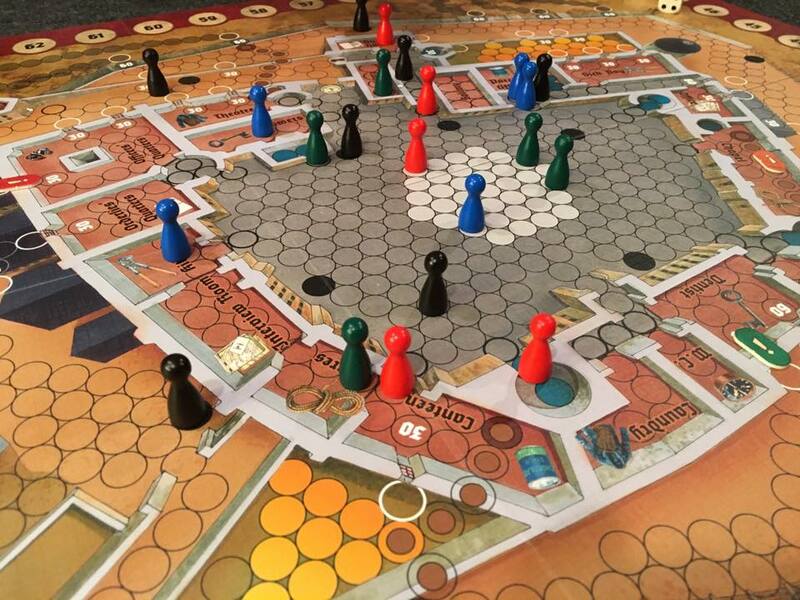 Escape from Colditz is like a crescendo. It begins slowly while prisoners are collecting equipment and while the German player attempts to create some semblance of a secure perimeter, balancing the guards inside and outside the courtyard. As soon as some of the Escape Officers have equipment in hand, the tension in the game rises dramatically. Escape becomes imminent, but determining when an escape will occur is nearly impossible, because only a reasonably high die roll will compel a prisoner to bolt. That or a well-timed effort by several prisoner groups escaping simultaneously. The only hope for the Security Officer is to intuit where the prisoners are assembling and where an escape will occur next. If he’s good, he will keep track of how the equipment is dispersed, but that strategy only goes so far. The Escape Officers are free to trade equipment. If you’re wondering about balance, I think the Security Officer has the more difficult job. 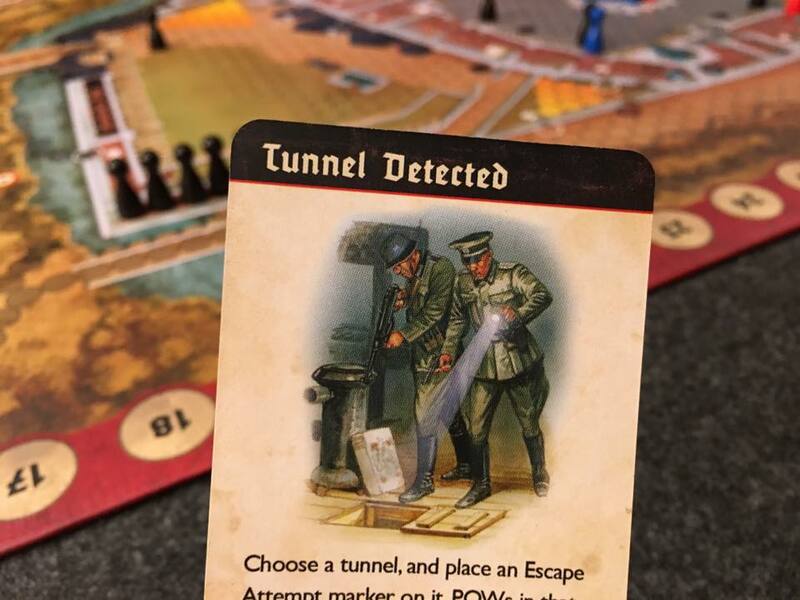 The map and clever use of the Opportunity Cards afford many avenues of escape, and there is only so much a determined German player can do to deter what seems to be an inevitable outcome. Sooner or later someone will roll big, and when that happens, there is often a better chance than not that a prisoner will slip through the dragnet. Since the game is turn-based, it is easy to adjust the difficulty. I suspect that we will find ourselves using one of the optional rules if Security Officers continually find themselves on the losing end. It’s simple to make such adjustments by requiring additional escapes before the turn track ends, or by setting the turn track on 40 or 30 turns instead of 50 or higher. 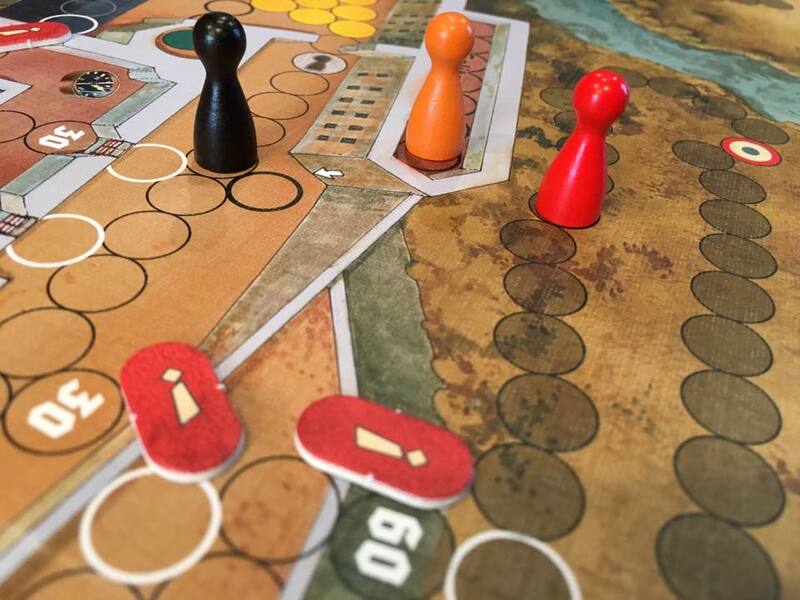 I also think the roll-and-move aspect of the game is easy to swallow because of the openness of the board and the fact that players are not constrained to just moving a single piece. Also, the fact that you get to draw a card when rolling low takes away most of the “sting” that can sometimes be associated with not being able to move very far. Nerve and dash? That’s all you needed to say. I think I’m chuffed to bits. Read other reviews of great Osprey Games titles, such as Agamemnon, They Come Unseen, The King is Dead and Escape from the Aliens in Outer Space! A short Escape from Coldtiz FAQ from Osprey Games can be found here. These are the questions I had while playing Escape from Colditz prior to my review. 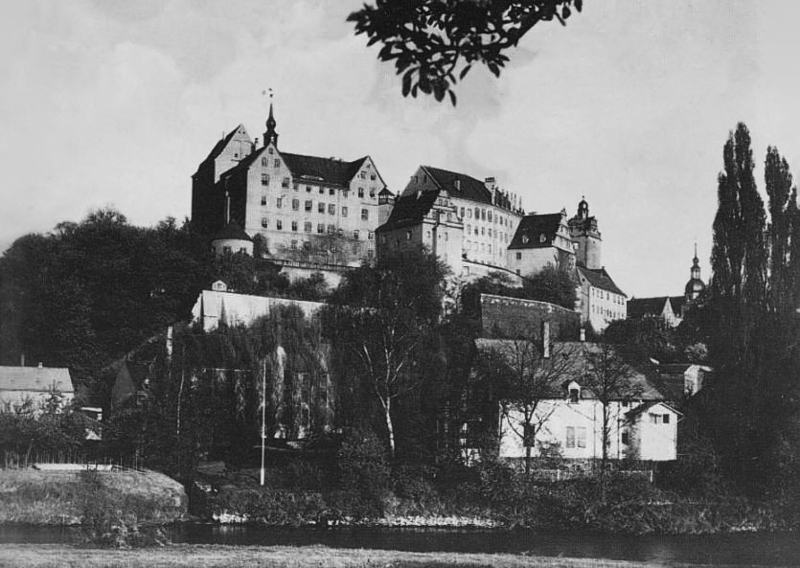 Colditz Castle in April 1945. Sounds like a fun one! I don’t know if I’ve ever seen a prison escape game before, it’s a great theme. We’ve really had a lot of fun playing this. Even Ava (our 10-year-old daughter) managed to find a way to escape, and through the front gate no less!